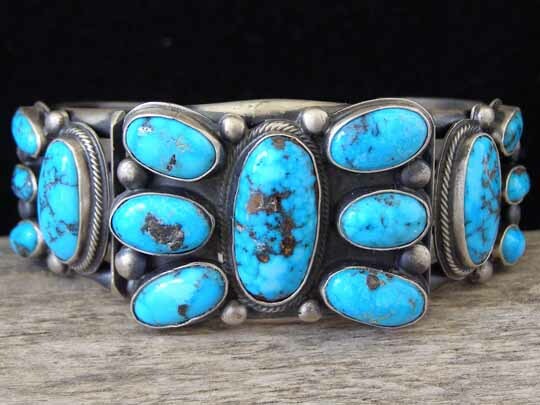 Paul J. Begay Persian Turquoise Cluster Bracelet size 7"
This is a gorgeous fifteen-stone cluster bracelet set with vivid blue ovals of natural, untreated Persian turquoise. This is classic blue Persian turquoise from the mines in Nishapur and very few sets of stones this size are still to be found in the United States. This is the same turquoise found in the tombs of the pharaohs in the Egyptian pyramids. Paul created a central butterfly cluster with additional four-stone clusters to left and right. The stones are set in smooth bezels. The cuff consists of three lengths of low-dome wire which are fused at the terminals. Absolutely stunning! Hallmarked P.J. BEGAY and stamped STERLING inside. Stones: center 7/8" x 7/16"; 2 ovals 11/16" x 3/8"; 6 ovals 1/2" x 5/16"; 6 ovals 3/8" x 3/16"